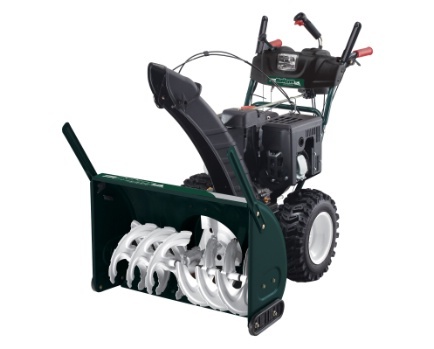 The Bolens snow thrower, model H55LH clears 30 inches at a time. It comes with the 357 cc engine and 6 forward speeds. Suitable for most home owners in a suburban situation it is powerful enough to clear most snow banks, yet small enough to be stored away in your garage or shed without taking a lot of room. There is also a 4 way chute control to provide you with lots of control over exactly were the snow is going to go. This can be very helpful in tight situations between trees, buildings or cars. A unique feature of this snow blower is that you can steer right or left with the click of a trigger. No more man handling a heavy snow thrower, just depress the trigger to steer in the direction you want to go. Taller poly chute focuses concentrated blasts of snow – arctic tested: won’t rust, dent, or crack! Oil pre-filled in engine – gas it up and you’re ready to go! This snow blower has lots of features. Including space saving handles, in dash yard light, prefilled engine with oil, to tool less drift cutters. This machine will meet the needs of most urban situations clearing all of the snow that mother nature can throw at you. Most customers will have to arrange for delivery of their new snow blowers. They are far too big to take home in your car. So you will need a trailer, rent a van or arrange for delivery by the store that you are purchasing the snow blower from. There will be a charge for this service. But it will be the easiest way to arrange for your new snow blower to be delivered to your home. Snow blowers can be purchased with tire chains. They provide extra traction in icy situations. In addition, snow shields are also a good idea. They will protect you from windy conditions and snow being blown back at you from the wind. Purchase a snow shield for most snow blowers including the Bolens snow thrower, model H55LH . Online Reviews: We were unable to find any online reviews for the Bolens 30 inch , model H55LH Dual Stage Snowblower, however please leave your comments at the end of this blog if you have used one of these machines. This Bolens snow blower is a powerful machine and should be treated with safety in mind. Carefully read all of the safety guidelines in the manual prior to operating the machine for the first time and follow these guidelines to ensure that both you and the machine do not have an accident. Prior to starting the Bolens 357cc 30inch Dual Stage Snowblower the first time each day, perform a quick walk around check of the machine to ensure there are no loose parts and no leaking fluids. Check the engine oil to ensure that it is at the correct level as specified by the manual. Top up if necessary. Fill the fuel tank while the engine is cold and prior to using the machine. If you do spill fuel, wait until it has fully evaporated prior to starting the engine. Never spill fuel on a hot engine to avoid fires and always fill the fuel tank outdoors to avoid any possibility of vapors going into your house. Like all snow blowers or snow throwers, maintenance is important for your machine to operate at a peak level for many years. Change the engine oil regularly, check the belts for tightness, change the spark plug as required and grease any spots outlined in the manual. If you need to leave the snow blower outside all year round, cover the machine with a proper cover to keep it looking new and avoid deterioration of the tires and metal components.